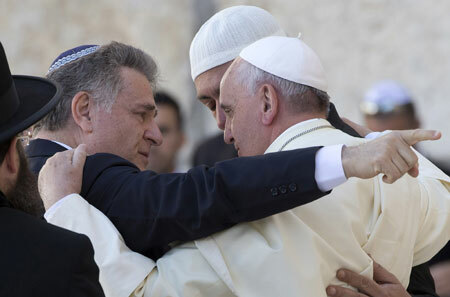 On his last day in the Holy Land, Pope Francis prayed at the Western Wall, the holiest site in Judaism, before an emotional hug with two old friends – a Muslim leader and a rabbi. Francis stood at the Wall for more than a minute and a half, most of the time in silent prayer, before reciting the Our Father. Then he followed custom by leaving a written message inside a crack between two blocks. He was accompanied by his two friends Rabbi Abraham Skorka and Omar Abboud. Rabbi Skorka said the Pope’s message contained the text of the Our Father and of the 122nd Psalm, traditionally prayed by Jewish pilgrims who travel to Jerusalem. Earlier in the morning Pope Francis toured the Dome of the Rock on the Temple Mount, sacred to Muslims as the place from which Mohammed ascended to heaven, and spoke to Muslim leaders. Addressing his listeners as “brothers” – rather than “friends”, as indicated in his prepared text – the Pope pointed to Abraham as a common model for Muslims, Jews and Christians, since he was a pilgrim who left “his own people and his own house in order to embark on that spiritual journey to which God called him”. “We must constantly be prepared to go out from ourselves, docile to God’s call,” especially “his summons to work for peace and justice, to implore these gifts in prayer and to learn from on high mercy, magnanimity and compassion,” the Pope said. In his remarks to the Pope, the grand mufti of Jerusalem, Muhammad Ahmad Hussein, accused Israel of impeding Muslims’ access to Jerusalem’s holy sites. Later Pope Francis visited a memorial to victims of terrorism, a stop that had not appeared on his original itinerary. It was added at the request of Israeli authorities, in reaction to his spontaneous decision the previous day to pray at Israel’s separation barrier in the West Bank. The separation wall, which Israel says it needs to protect itself from terrorism, has been a target of Palestinian protests and international condemnation. At the terrorism memorial, the Pope prayed with his hand against the stone, the same gesture he used at the separation wall and at the Western Wall. Following a brief wreath-laying at the grave of Theodor Herzl, father of the Zionist movement that led to Israel’s founding, Pope Francis visited the Yad Vashem Memorial to victims of the Holocaust. There he greeted half a dozen survivors of the Nazi genocide, kissing their hands in honour. “He took my hand in his two hands and kissed my hand. I was dumbfounded. I never had a rabbi do that,” Joe Gottdenker of Toronto told the American Catholic News Service. Mr Gottdenker, who was rescued as a baby by a Polish Catholic couple, said he “was moved much more than I had even anticipated”. Pope Francis’ next stop was a visit to the two chief rabbis of Israel, leaders of the country’s Sephardic and Ashkenazi communities. The Pope told them that relations between Jews and Catholics had progressed greatly in the half century since the Second Vatican Council, which declared that Jews were not collectively responsible for the death of Jesus and that God’s covenant with them had never been abrogated. Pope Francis called on Christians and Jews to develop greater appreciation for their common “spiritual heritage”, through deeper knowledge of each other’s faith, especially among the young. Even by the standard of his densely packed Holy Land trip, the Pope’s morning was especially busy, and he soon fell behind schedule. Many other Jerusalem residents found themselves in the same situation, as streets cleared to facilitate the Pope’s movements caused traffic jams across the city. It was only the latest sign of the Pope’s friendship with Peres, who invited him to Israel shortly after the start of his pontificate. At Yad Vashem, the Pope greeted other dignitaries with a handshake but gave the president a warm embrace. In his address at the presidential palace, Pope Francis praised Mr Peres as a “man of peace and a peacemaker,” and, as the Pope had done the previous day to Palestinian President Mahmoud Abbas, asked that “all parties avoid initiatives and actions which contradict their stated determination” to end the Israeli-Palestinian conflict. The Pope also stressed the “universal and cultural significance” of Jerusalem, and its importance to Christians, Muslims and Jews. “How good it is when pilgrims and residents enjoy free access to the holy places and can freely take part in religious celebrations,” he said. As in his speeches to Mr Abbas and to the king of Jordan over the previous two days, Pope Francis also spoke up for the local Christian community, telling Mr Peres its members wished to “contribute to the common good and the growth of peace,” and thus deserved to be “full-fledged citizens” of Israel.